Google recently announced that it will take steps to improve YouTube metrics reporting for its advertisers, while addressing privacy concerns for users. It will rely less on pixel and cookie data to give advertisers an idea of how their video campaigns are faring, and focus on developing better mobile video tracking tools. On the user side, viewers will be able to mute advertisers that track them with irrelevant ads. Google is trying to strike a balance between transparency and control for viewers, and better, highly refined metrics for advertisers. Why the sudden move away from pixels and cookies? Google’s blog, Inside AdWords, indicated that 50% of all YouTube video viewing now happens on mobile. Traditional desktop tracking tools don’t provide an accurate overview for mobile based video campaigns because pixels and cookies were not designed for the way users interact with YouTube on mobile. This means measurement can be skewed. Google is developing a new way of measuring viewership to rectify this discrepancy. How is this a win for advertisers? In addition to a clearer view of campaign dynamics, it allows advertisers to reach the right audience. The new tool will provide accurate metrics to advertisers across devices. Information from a user’s Google account, such as past searches and Customer Match, can be used to suggest the ads they see on YouTube. In addition to this, Google will also allow advertisers to use their own data to target high value YouTube shoppers. For viewers, Google will put the control back in their hands by allowing them to mute a particular advertiser across multiple platforms. For example, if a user has purchased a gym membership and is still being tracked with gym promotions, they can mute that advertiser. According to AdExchanger, the new system will be cloud based with Google collaborating with several Media Rating Council third party vendors. This initiative was recently rolled out to a few select advertisers. Instagram waded into the shoppable ads arena when it trialled its version of the popular ‘buy now’ button with twenty US brands. The social photo sharing platform has taken steps to close the gap between browsing and shopping by allowing users to learn more about products from within their app, and then purchase them seamlessly. If this sounds eerily like Pinterest, you may be onto something. Instagram recently ran afoul of Snapchat when it was accused of copying Snapchat Stories with its Instagram Stories. After several failed attempts to purchase the platform, Mark Zuckerberg did the next best thing, copied Snapchat’s most coveted feature, Stories, on Facebook-owned Instagram as Instagram Stories. 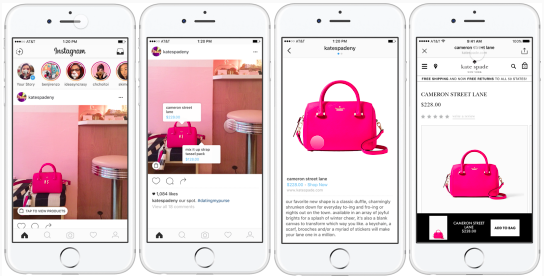 Instagram is ready to play copycat again with its venture into Shoppable Ads. It set about testing posts with select brands in the US to allow users to learn more about the products they see before buying them. Instagram presents the user with a ‘tap to view’ icon at the bottom left of each photo which expands tags for up to five products. The tags contain the details and cost of the items but don’t immediately appear, users must hover over the ‘tap to view’ indicator to see a featured item. Users can then scroll through the products shown and decide to purchase from within the app. Pinterest has had this feature for some time, and has seen remarkable results. 75% of its users have purchased something on the platform or because of it. Pinterest users stay on the platform for approximately fifteen minutes per visit, giving marketers plenty of time to deliver ads to them. The demographic for Pinterest and Instagram used to vary widely, with Instagram being the platform predominantly for Gen Z and younger Millennials, and Pinterest skewing predominantly towards women in their late 20s to early 40s. Recently, Pinterest has seen a spike in Millennial use, with 67% of its users falling into that category. Instagram is eager to cash-in on this potential new source of revenue and is now strongly courting brands to use its platform to reach their younger demographic. Add to this, the eventuality of a ‘save for later’ button, and Instagram fully moves into Pinterest’s territory as a save and shop platform. This latest development is aimed at Instagram’s discovery audience, i.e., those who use the platform to look for the latest items but aren’t sure what they want just yet. Much like Pinterest, it enables retailers to capture users as they are information gathering and turn them from inspired browsers to buyers. Why is this development important? It cuts out a step/barrier to purchase. Users don’t need to leave the app and open a separate search window to find out more about the products they like. They can navigate and get all the pertinent information they need all within Instagram’s platform. The consumer can then hit ‘shop now’ from within the tags and be taken directly to complete their purchase on the retailer’s website. It solves the problem of inserting unwieldy captions to redirect users to click on links to circumvent Instagram’s ban on organic links within posts. Shoppable ads have the potential to steal revenue from online shopping giant, Amazon, as users are heading onto sites like Pinterest and Instagram to discover new products and get alternative shopping ideas. Most mobile use is spent in-app. Instagram has the highest rate of mobile use among social networks in the US. Given that Instagram is primarily mobile-focused, making products shoppable is a vital step for the social media platform and for brands that have a significant following on it. Twenty popular US retailers have joined the endeavour, predominantly up-market brands such as Michael Kors, Kate Spade New York, Coach, Abercrombie & Fitch, and Hollister. The tags will be initially rolled out to iOS users in the US, but there are definite plans in the works to expand globally. Currently, this is a free service to post to your followers but Instagram plans to monetise the shoppable format by allowing brands to advertise to relevant target groups outside of their followers. While advertisers have seen success using Instagram ads, only time will tell how users will react to yet another form of advertising. If it does not alienate its original base of photography enthusiasts, it has the potential drive significant ROI from Instagram.